90% of American homeowners hire a qualified agent to sell their homes – and with good reason. Selling is a daunting task for any homeowner. It involves pricing the house, determining whether a buyer is qualified, creating and paying for advertising, showing the home to prospective buyers, understanding real estate regulations, being available whenever a prospective buyer wants to view the property, negotiating and preparing contracts, and coordinating the details of a closing. It’s no surprise that homes sold by real estate agents sell faster, more easily, and for more money. Competence: When you first meet with an agent, expect to see a portfolio of credentials, past achievements, sales volume and letters of recommendation. Look for evidence that his or her background is relevant to your needs; that is, someone whose portfolio includes success with houses in your price range, preferably in your neighborhood. Comfort: The importance of being comfortable with your agent as a person cannot be overstated. You're going to be dealing with this individual on a regular basis, maybe for months, during a time that can be trying. Your agent will share the tension, anticipation, frustration and ultimately joy of selling your house. It takes a combination of these two characteristics to inspire the confidence a homeowner needs to maintain peace of mind through the selling process. This is something every Coldwell Banker agent strives for. If you’re looking for an agent, start by talking to friends, neighbors, relatives or anyone else whose recommendation you trust. Another way to find an agent is by responding to local advertising from agents, such as "just sold" mailings. These self-marketing efforts suggest the agent may have more to offer than one who picks up the phone when you call the local real estate office. You should connect with a qualified agent as soon as you decide to sell your home. There are always buyers looking, and the agent is your bridge to those buyers. While the number of buyers remains relatively constant, they tend to act when a new property with high value comes up for sale. Timing is key, and a good agent is able to act quickly. Peak selling seasons vary in different parts of the country, often dictated by weather. Late spring and early fall are prime listing seasons because houses tend to "show" better in those months. And of course, people like to do their house shopping in pleasant weather. But keep in mind that there are also more houses on the market during peak seasons, which means you'll have more competition. While there is seasonality in the real estate market, it shouldn’t completely dictate your decision of when to sell. Even if you're under no pressure to sell, waiting for particular market conditions is not likely to increase your profit potential. While you’re waiting for conditions to improve, you are continuing to make mortgage payments, insurance payments, HOA payments if applicable, and home repairs. This increases the amount of money you invest in your home while the price of your next home may also be increasing. Average listing times vary from 14 to 90 days, depending on a variety of factors, which your broker can fill you in on. When your property is first put on the market, creating a perception of value and a sense of urgency will get you the greatest number of showings. Buyers who look at your property in the first few weeks are typically financially qualified and have been working with a Realtor®. They will likely have seen other properties in the area, and know about market prices. They contacted agents months ago about properties they found, and are prepared to make offers when they see the right home at the right price. By the third week, the number of showings will drop. From this point, most potential buyers are just entering the market and will not be ready to make a decision for months. They still have to arrange financing and have not seen enough properties. So, your best opportunity is during the initial exposure to the market. This is when you’ll have access to the largest pool of buyers, and when properties sell at the highest price. A house that has been on the market for only two days is a "must see." As the days pass, buyers think the seller is anxious and should be willing to negotiate. When the property is on the market longer, they wonder why it hasn’t sold and think something might be wrong with it. Buyer perceptions of value decrease with every day a house is on the market. This is another reason a property will most likely sell at its highest price within its first few days on the market. If a property is overpriced, buyers and agents will notice it when it hits the market, but there won’t be a perception of value. Therefore there will be no showings or offers. If the property is priced a little below buyers’ perception of value, it becomes a hot property. There will be numerous showings, multiple offers, and possibly a bidding war. By setting the price a little below buyers’ expectations, the seller simulates the conditions found in an appreciating market, and ultimately sells more quickly and possibly for more than the asking price. Order an appraisal to price your home. Ask for feedback from people who walk through your home. This will help you see your house as a commodity that has positive and negative selling points. Ask a neighbor, friend or relative to point out advantages or disadvantages about your house that you might not have considered. Most buyers leave room for negotiation when they make an offer. Thus, a certain degree of flexibility is called for on the part of the buyer and seller. While it is ultimately your decision to accept or reject an offer, or present a counter-proposal, a good agent can be of great assistance during the negotiating process. As negotiations proceed, your agent will inform you of your options in responding to each offer. To get an estimate of fair market value, plus details on recently sold homes, ask a Coldwell Banker agent for a Competitive Market Analysis (CMA) of your house. This service is free of charge, with no obligation. Unless your house is nearly new, chances are you'll want to do some work to get it ready to sell. What type and how much work depends largely on the price you're asking, the time you have to sell, and of course, the present condition of your home. 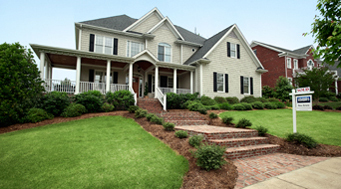 "Curb appeal" is the common real estate term for everything prospective buyers can see from the street. Keep two key words in mind: neat and neutral. New paint, an immaculate lawn, picture-perfect shrubbery, a newly sealed driveway, potted plants at the front door…put them all together, and drive-by shoppers will probably want to see the rest of the house. People may look behind closet and crawl space doors, as well as those to the bedrooms and bathrooms. So get rid of all clutter; have that garage sale and haul away the leftovers. After you've cleaned, try to correct any cosmetic flaws you notice Paint rooms that need it, re-grout tile walls and floors, remove or replace worn-out carpets. Replace dated faucets, light fixtures and handles on your kitchen drawers and cabinets. For more information on getting your home ready to show, take a look at our Home Selling Checklist. You're unlikely to sell for more than 15% above the median price of other houses in the neighborhood, whether you do $1,000 worth of work or $50,000. That's why you might want to ask your broker’s opinion about the viability of recouping the cost of any major renovations before you start the work. This is particularly important because if the buyer's inspection reveals major problems with your home's structure or mechanical systems, they can negotiate to have them fixed properly. Sometimes, repairs may be required before the transfer of title takes place. This is especially true in sales that involve financing insured or guaranteed by the government (FHA/VA loans, for example). You may have also heard about lawsuits involving sellers who failed to disclose problems before the sale, such as an addition to the house that wasn't built to code or the presence of lead-based paint. Most states maintain very specific disclosure laws and require sellers to provide buyers with a completed and signed Property Condition Disclosure Form. Consult your Coldwell Banker agent for details. These are just a few reasons to retain a lawyer or agent who knows as much about the condition of your property as you do. It's also a good idea to get the buyer's written acknowledgment of any major problems when you accept their offer. A Coldwell Banker Home Protection Plan offers protection for you and your buyer, covering repair or replacement costs for breakdowns to most major systems and built-in appliances up to a year or more after the date of closing. Our agents will list your home in the Multiple Listing Service (MLS), a system that reaches millions of buyers around the world. The system enables brokers to share commission on the sale of houses. For example, if you list your home with one broker and another broker actually sells it, he or she shares the commission. The advantage to you is clear: More brokers have an interest in selling your home. Fewer than 5% of buyers actually purchase the first house they call an agent about. So our agents will design advertising to "find the buyer" with appealing layouts, eye-catching photos and professionally written descriptions. They also use multiple channels—online, print, radio, TV and direct mail. As another valuable part of the marketing process, our agents offer open houses to prospective buyers who want a low-pressure, "browsing" atmosphere. If you have an open house, you shouldn't expect it to generate a sale, at least not directly. What you can expect is increased showings of your home after the event, whether from calls to your broker or attendees returning with their agent. Agents often hold an open house for other agents shortly after a house is listed. This type of event, usually held mid-week when other agents can give it their full attention, can be as important as your listing in the MLS. The more professionals who see your home, the more prospects you're likely to reach. Keep in mind that when you sell, you’ll owe your agent’s broker a commission. Perhaps the most important matter you negotiate at the time of listing your house with a broker is the duration of the listing contract. Terms vary, but listing agreements are seldom for less than three months or greater than one year. Some brokers offer homeowners an "out" if the agent isn’t performing or if they are unhappy with their service. Good agents are also extremely helpful in the days immediately prior to the closing. They'll help you prepare by giving you a step-by-step preview of the entire process and what will be expected of you. They'll also make sure you bring all necessary documents and other information. The buyer, the buyer’s agent, and the broker who represents your agent will all be at the table when you close the sale and hand over the keys. (You’re welcome to invite your agent, but his/her presence is not required). The lender and/or title companies will also be there. We'll help make the experience of selling your home as smooth and easy as possible. Even if you're not ready to list your home and simply have questions about the local market, price or mortgage trends, you are welcome to contact the Coldwell Banker office nearest you.